I know, it sounds all official, doesn’t it? It’s not. I just decided that annuals would be my theme this month, although there are enough of them to spill into next month too, especially mixed up with other things I might think of along the way (not to mention that we have a new issue out in less than a couple of weeks). 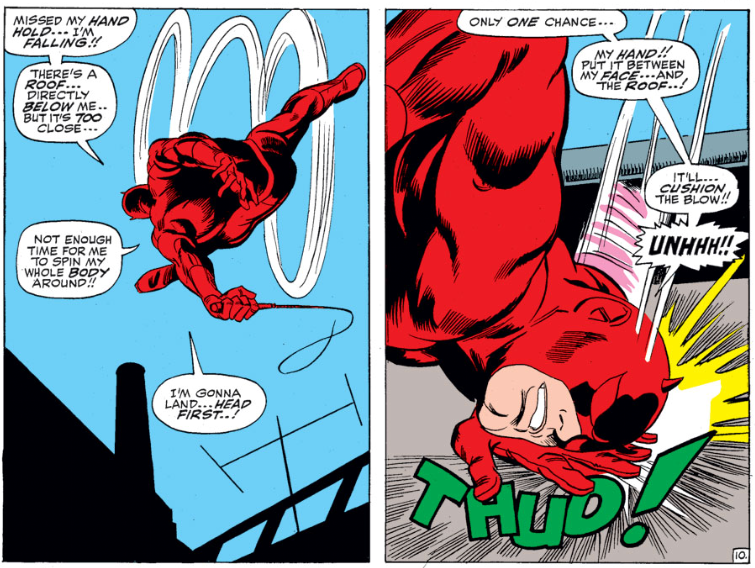 The very first Daredevil annual, from 1967 by Stan Lee and Gene Colan, has been reviewed in considerable detail by Robert of The Matt Murdock Chronicles so I will only look at a handful of panels here. When I get to the second annual, I’ll give it a more in-depth treatment. However, I’ll begin by just offering a couple of impressions I got from reading this one. First of all, it’s clear that one of the reasons publishing companies put out annuals to begin with is to reach out to new readers who may not be familiar with the ongoing series. Of course, back in the day, the hero’s origin had to be shoehorned into every single issue, just in case someone didn’t know that Daredevil, in this case, was a blind lawyer/vigilante with heightened senses. This concept is pushed even further in this case, as Matt spends three full pages engaging in some kind of monologue that’s supposed to sum up everything going on in his life. 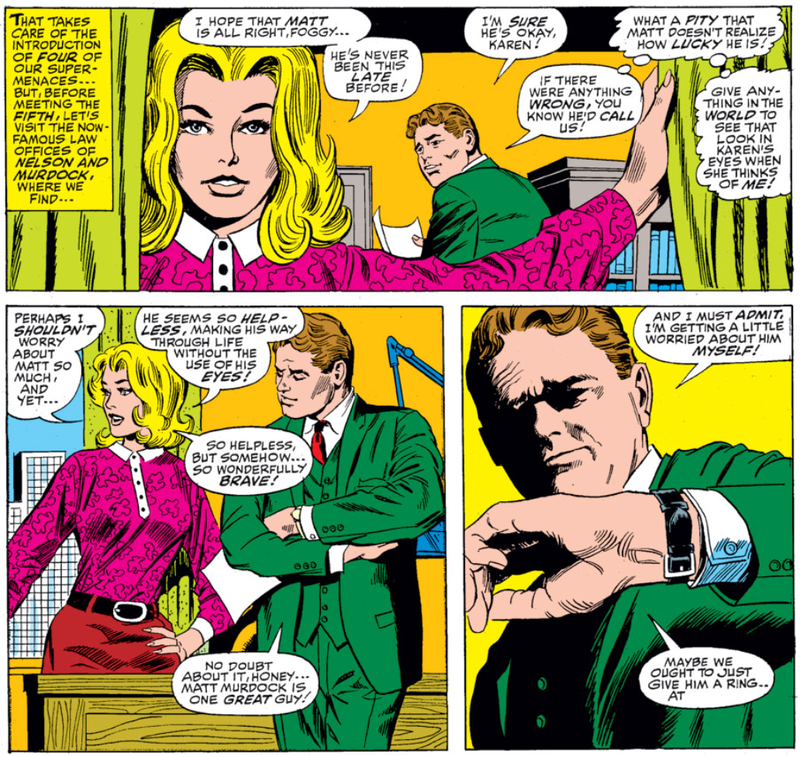 At some point, Stan Lee must have realized that no one, with the possible exception of characters in soap operas, actually talk to themselves that much, so he even has Matt comment on the fact that he’s talking to himself. Either way, the monologue does a decent job of letting the new reader know everything he or she needs to know. A villain will only actually kill you if he can do it in style. In a surprising team-up, Electro and the Matador (addressed by DD as “Matty” at one point in this issue) have joined forces and knocked DD out cold. Or, so they think. He’s actually only pretending to be unconscious, which we learn in the next panel. The voice of reason, in another surprise, is the Matador who asks: “But, why not finish him off now, while you have the chance?” Because he takes pride in his work, “Matty.” That’s why. Geez, are you slow or something? In a pinch, your hand makes for an excellent cushion. Forget everything you’ve heard about performance enhancing drugs. Your favorite heroes take them too! 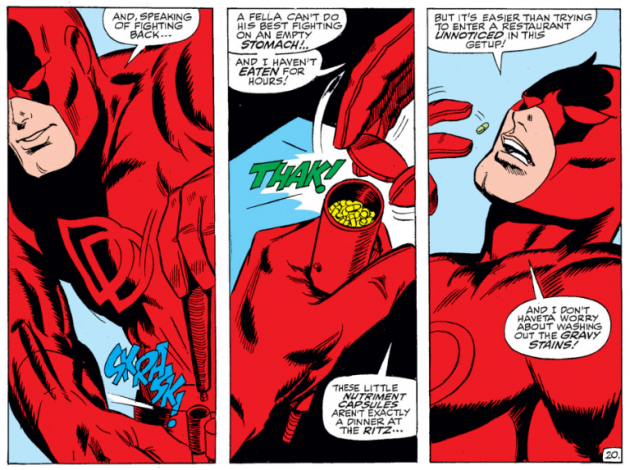 Those nutritional capsules were apparently a one hit wonder. And one has to wonder, were they really all that filling? And what gravy stains? Matt “I can color coordinate my wardrobe while driving and reading the phone book better than any sighted man” Murdock spills when he eats?! I’m shocked. Really, I am. Okay, that’s it for now! Read more about this issue by following the link in the beginning of the post, and I’ll see you all later this weekend! You’re right, he should’ve made sure he hit the ground face first, opening his arms wide and straightening his body to maximize the impact. 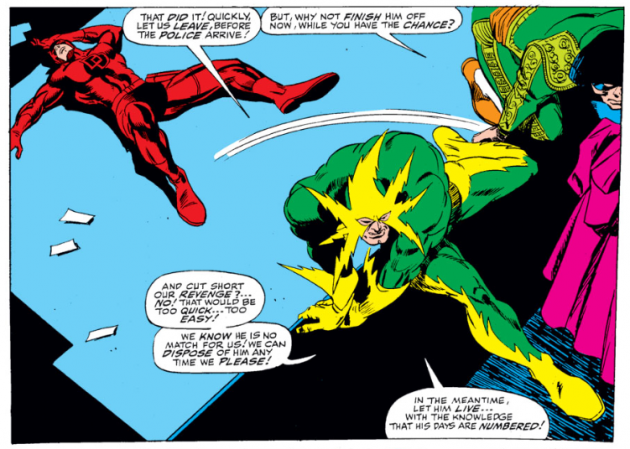 I loved Electro’s reasoning for not killing off DD in this issue. If only modern day villains could be just as compassionate ;). funny that DD didnt impale his hand with his cute little horn. and my word verification was “wimpareau” which i believe is french for an effette gentleman.